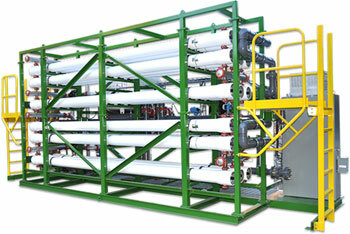 Reverse osmosis (RO) is the best alternative for high volume/high quality water treatment. The primary purpose of RO is to produce effluent filtrate (clean water) that has very little in the way of impurities associated with salts and other elements besides water. Reverse Osmosis can remove many types of molecules and ions from solutions, including salts. It is used in both industrial processes and the production of potable water from brackish water or sea water. Chemical analysis of the water is used to determine the proper design of the system, including the pre-treatment system. Various RO testing data are analyzed and considered in order to optimize the membrane’s specific applications. 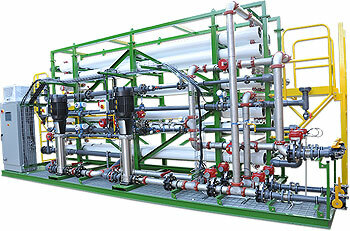 The images displayed on this page are of an RO system that was designed as part of a Zero Liquid Discharge system for an industrial company. Its total design capacity purifies up to 300 GPM of dissolved air flotation DAF and ultrafiltration UF pretreated water, containing no suspended solids, oil or grease. Phosphates/surfactants, salts and elements contributing to hardness in the influent water are removed. Each RO membrane system built by Ecologix can also be equipped with 100% redundancy, allowing your plant to continue full treatment even when one line requires cleaning. The entire system can be operated automatically based on an integrated PLC control system.